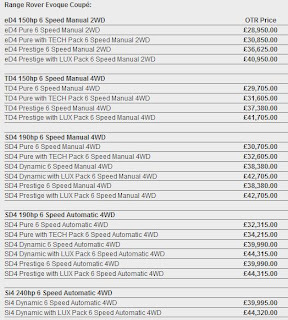 Land Rover has confirmed prices on the smallest, lightest model yet, the Evoque. The base eD4 Pure starts from £27,955, that's linked to a 6-speed manual 2WD model. 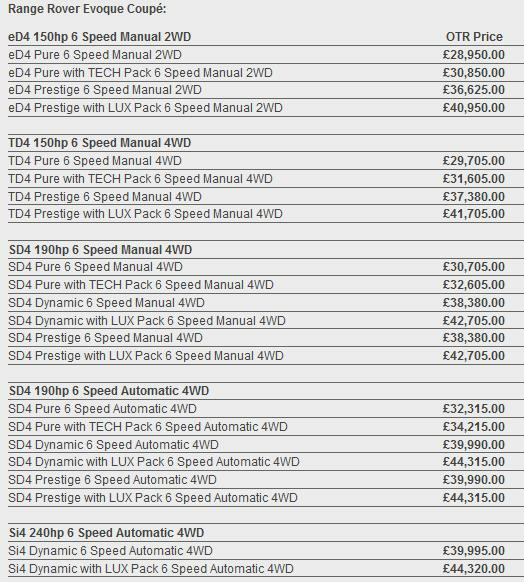 The 4WD equivalent is priced at £28,705. 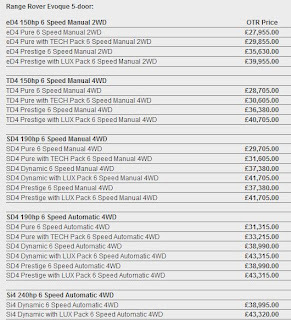 The coupé starts from £28,950, rising to a hefty £44,320 for the Si4 Dynamic with LUX Pack 6 speed automatic 4WD. 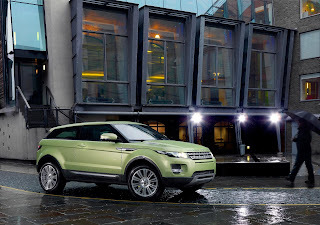 The Evoque will be offered in both 5-door and coupé forms and will go on-sale from September 2011. 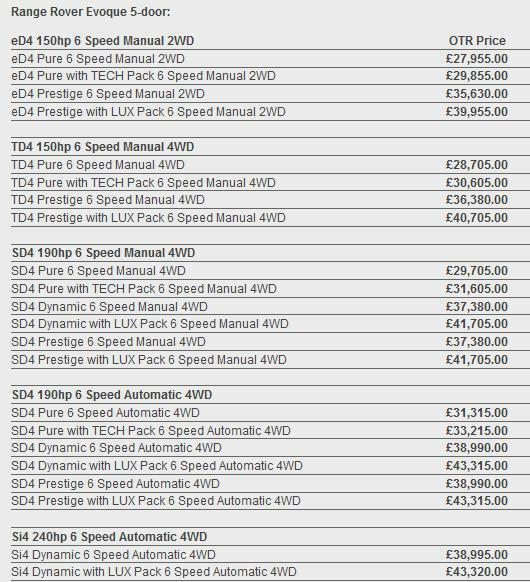 The updated 2.2 litre TD4 arrives with either 148bhp or 187bhp (150PS/110kW or 190PS/140kW) derivatives. The 2WD - on-sale early 2012 - coupé will achieve sub-130g/km of CO2. The new 237bhp (240PS/177kW) 2.0 litre Si4 petrol engine combines direct fuel injection, turbocharging and twin variable valve timing for exceptional driveability and fuel-efficiency and delivers 0-60mph in 7.1 seconds. Options available include 12 exterior colours, three contrasting roof treatments, seven alloy wheel designs, 16 contrasting interiors and a full sized, fixed, panoramic glass roof. 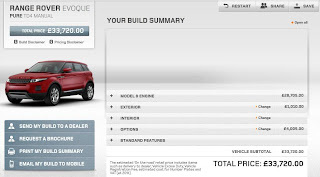 Click here for the online configurator. 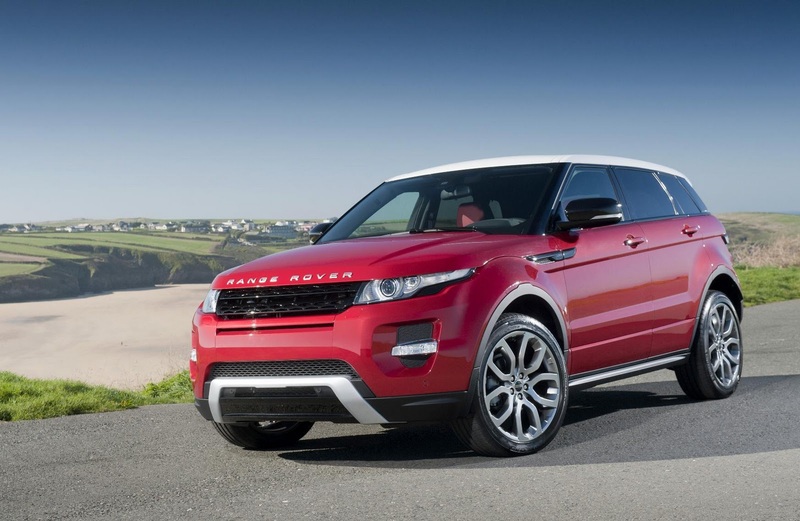 Evoque Pure is the purest expression of the original LRX concept. On the outside it is distinguished by the high-gloss black detailing across the tailgate and along the waistline, with a dark 'Atlas' finish to the grille and eye-catching side fender blades and, on the Coupé, bonnet louvres. As standard, Pure models come with 18-inch Sparkle Silver alloy wheels. Luxury informs every element of the Evoque Prestige models, from the exterior bright 'Atlas' detailing and 19-inch Diamond Turned alloy wheels, to the fine Oxford full leather interior in a selection of warm and inviting colour schemes with real wood finishers, tailored carpet mats and chrome tread plates. Metallic paint is also provided as standard and Prestige models benefit from xenon headlamps with signature LED lighting and front fog lamps. Nice job for posting this. 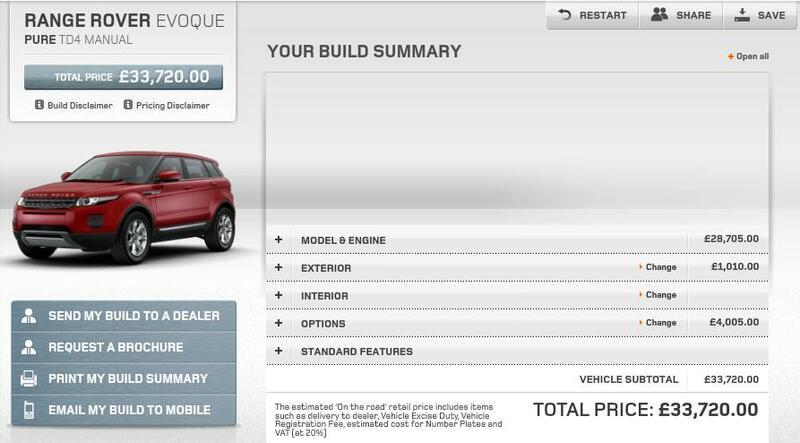 A very detail specifications of the Range Rover. A job well done.